The winner of the 2011 German "Game of the Year" (Spiel des Jahres) award is Qwirkle, an abstract strategy game in which players use wooden blocks in six shapes and colors to build lines on a free-form surface. 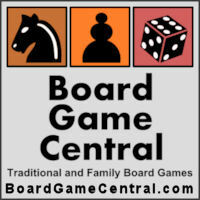 The rules are simple and quick to learn, and there are numerous opportunities for skillful play and strategic thinking. Qwirkle is the rare game that has as much appeal to adults as it does to kids. It's simple, yet the possibilities are nearly infinite. In addition to the Spiel des Jahres, Qwirkle has won numerous awards, including the Mensa Select, Parents' Choice, and Major Fun awards. 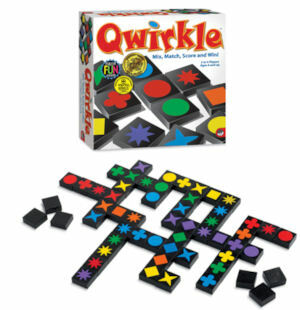 Qwirkle is actually an American game, and was published here several years ago, but was newly available in Germany this year, which is why it was eligible for the 2011 award. A related game is Qwirkle Cubes, which uses the same gameplay mechanic – building lines of the same shape or color – but uses dice-like cubes instead of tiles. Congrats to Qwirkle and its publisher, MindWare!